Class Insecta, order Coleoptera, family Curculionidae, genus Sitona Germar. Body length, 4.0-5.5 mm. Body and femora black; antennae, tibia and tarsus reddish. Rostrum as long as wide, sub-square, slightly narrowing apicad. Frons and rostral dorsum slightly depressed, with thin sulcus along midline. Eyes convex, with 2-3 eyelashes on upper margin. Pronotum sub-square, its lateral sides weakly rounded. Transversal sulcus on precoxal part of prosternum situated in the middle between fore coxae and apical margin of prosternum. Elytral pubescence usually gray or grayish-brown, without shine, with irregular rows of short and adpressed setae. Apex of aedeagus wide and straight blunted. Oviposition begins after spring warming and lasts until the end of May . June. Female lays eggs around the base of host plants. Egg suboval, 0.38 mm in diameter. At first it is yellow-whitish, later it becomes darker. Embryogenesis lasts 10-21 days. Body length of larva after hatching, 1 mm; head width, 0.16-0.18 mm. Larvae of the first instar go deep into the soil along fissures and penetrate inside root tubercles. Later they devour thin roots. Body length of larva in last instar, 5-6 mm; head width, 0.55-0.65 mm. Larvae is cream-whitish with light-brown head before pupation. Pupa develops 8-10 days. 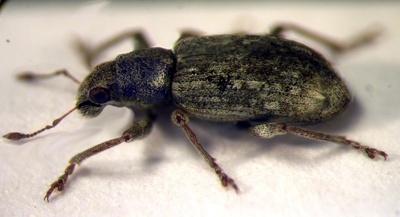 Young beetles appear at the end of June . August. One adult devours about 17.5 sq. mm of the leaf surface in 24 hours. Fertility is about 1,000 eggs. Mating occurs few times. Adults of the new generation mate and lay eggs one week after emergence. Europe, Middle East, Iran, Afghanistan, Mongolia, Western China, introduced to the Northern America. In the former USSR, it inhabits the European part of the former USSR northward to Leningrad Region, whole Caucasus, the south of West and East Siberia, the Far East, Middle Asia, and Kazakhstan. Monovoltine. Perhaps bivoltine in Middle Asia because pupae and adults occur twice, in the beginning of summer and in autumn. Adults hibernate on the surface layer of soil between leafstalks at base of host plants. Adults are active and feed during winter warming. Oviposition begins without additional feedings. Air humidity 70-75% is necessary for successful development of pupae. Pygostolus falcatus Nees. is a parasite of adults. Both adults and larvae cause damage. They harm mainly on alfalfa and sweet clover crops in Middle Asia. Elimination of root tubercles by larvae decreases the harvest of alfalfa and nitrogen accumulation rate in plants and soil. Control measures include using fertilizers for seedling development acceleration; alfalfa growing in crop rotation less than 3 consecutive years; burning of the litter on fields in winter time; disking of fields in spring. In Middle Asia, delay of irrigation of alfalfa fields by 20-25 days during mass pest pupation is recommended. Alimdzhanov, R.A. 1951. The pea weevils of the Genus Sitona Germ. from the fauna of Uzbekistan. Tashkent: AN Uzbek. SSR. 183 p. (in Russian). Baitenov, M.S. 1975. The pea weevils of the Genus Sitona Germ. from the fauna of Kazakhstan. Vestnik sel.skokhozyaistvennoi nauki Kazakhstana (2). Kurmanov, G.Sh., ed. Alma-Ata: Minsel.khoz. Kazakh. SSR. P. 121-124 (in Russian). Ioannisiani, T.G. 1972. The weevils (Coleoptera, Curculionidae) of Byelorussia. Minsk: Nauka i Tekhnika, 352 p. (in Russian). Isaev, A.Yu. 1994. Ecological and faunistic review of the weevils (Coleoptera: Apionidae, Rhynchophoridae, Curculionidae) of the Ulyanovsk region. Ulyanovsk: Branch of the Moscow University, 77 p. (in Russian). Korotyaev, B.A. 1984. Family Curculionidae. In : Kopaneva, L.M., ed. Keys to harmful and useful insects and mites on the annual and perennial grasses and leguminous plants in the USSR. Leningrad: Kolos. P. 115-127 (in Russian). Petrukha, O.I. 1969. The pea weevils of the Genus Sitona Germ. from the fauna of USSR, damage to bean crops. Leningrad: Nauka. 255 p. (in Russian).